(Hong Kong) — Twenty-one years after Hong Kong’s return to China, the stock market of the former British colony has developed an intricate, symbiotic relationship with its mainland counterparts — they are increasingly interconnected while competing with each other. 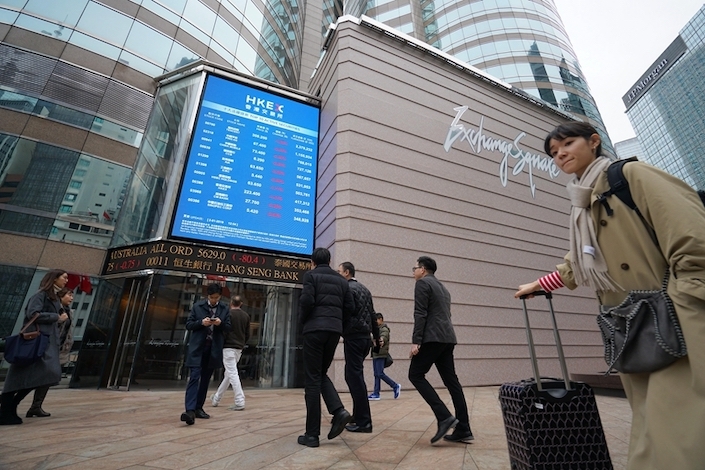 The ties between the Hong Kong and mainland markets have become ever closer as more mainland companies seek listings in Hong Kong and as stock-connect programs enable investors to trade on all of China’s bourses. According to data released last week by the Hong Kong exchange, more than 50% of listed companies, 70% of total market cap, 80% of average daily transactions and 95% of initial public offerings (IPOs) in Hong Kong are linked to the mainland. But the deepening interdependence has also raised concerns that the surge of mainland capital in Hong Kong may erode the market’s pricing independence and bring in excess speculation. Meanwhile, competition between Hong Kong and the mainland for tech titans has raised tensions. 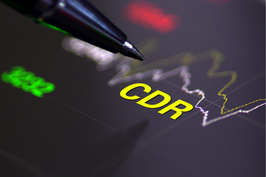 Last year, regulators in Beijing proposed a pilot program of China Depositary Receipts (CDRs) to entice tech giants to float their shares at home. That came shortly after the Hong Kong bourse unveiled listing rule changes targeting blockbuster tech listings. But experts say cooperation is more important than competition. 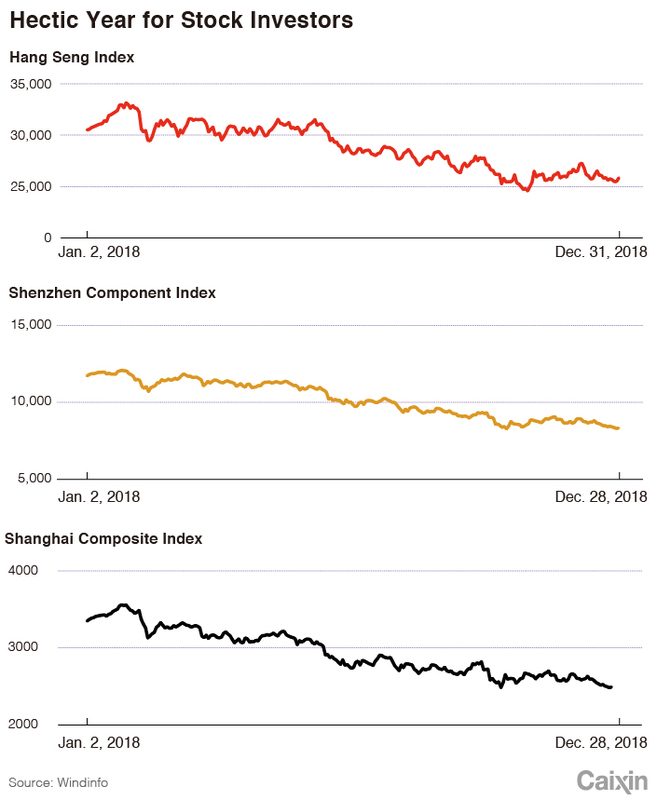 In any case, last year was a gloomy one for investors on both sides of the narrow Shenzhen River as Chinese markets posted significant losses amid the trade war with America and uncertainties facing the global economy. Hong Kong’s Hang Seng Index plunged 14% for the year after gaining more than 30% in 2017. The Shanghai bourse lost 25% and Shenzhen, 35%, making the mainland market the worst performer in the world. Both markets also made significant changes in 2018 in moving to embrace the global market and better weather the changing investment environment. On the mainland, domestic A-shares achieved the long-sought inclusion in the MSCI Emerging Markets Index after years of reform efforts to make the market more attractive to global investors. Securities regulators implemented a series of measures to improve the regulatory framework, streamline listing rules and bolster market performance in the aftermath of the 2015 Chinese market meltdown. In the southern financial hub, Hong Kong Exchanges and Clearing Ltd. (HKEx) made its boldest reform moves in 25 years by opening the door to companies with weighted voting rights, or dual-class shares, as well as certain pre-profit startups in a bid to attract more high-tech listings. The changes contributed to a boom of new listings in Hong Kong. With a record number of IPOs, many of them tech startups from the mainland, Hong Kong became the world’s largest IPO market. A total of 218 companies debuted on the HKEx in 2018, 25% more than in the previous year. They raised a total of HK$286 billion ($36 billion), more than double the previous year’s amount. The biggest IPOs were all from the mainland. China Tower — a telecom tower operator — raised HK$58.8 billion in the world’s largest IPO in two years. Beijing-based smartphone maker Xiaomi Corp. and online service provider Meituan Dianping were also among the biggest offerings in Hong Kong. The two companies were the only ones with dual-class share structures to list under Hong Kong’s revised rules. A rush of mainland tech companies to list in Hong Kong started in late 2017. Investment bank UBS said in a report last week that there are still plenty of IPO applications waiting in line in Hong Kong this year, especially tech leaders and biotech startups from the mainland. 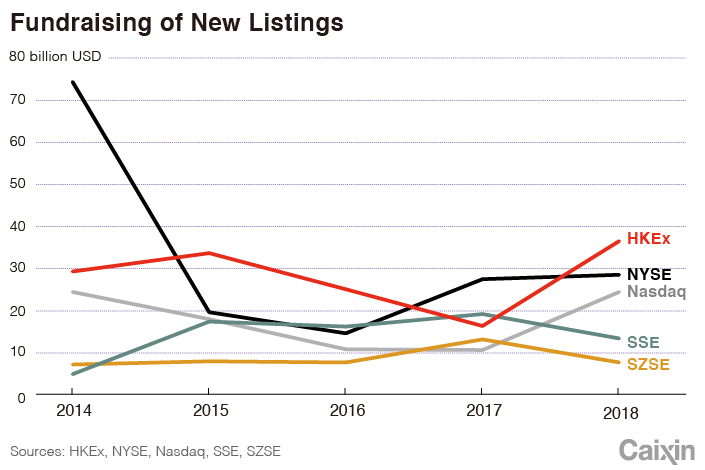 Despite the heated IPO market, most investors in the secondary market were hurt last year as nearly 70% of the newly listed companies later dropped below their listing prices, Caixin found. Tech giant Xiaomi and Meituan each dropped more than 30% over the past several months after their blockbuster listings. An investment bank executive said shares of many mainland companies slumped after Hong Kong IPOs, reflecting excessive valuation in the mainland’s private equity market. Price drops after flotation returned the stocks’ values to reasonable level, the executive said. Investors in Hong Kong and the mainland have experienced expanding access to each other’s markets with the Shanghai-Hong Kong stock-connect program beginning in 2014 and the similar program later linking Hong Kong and Shenzhen. The programs allow foreign investors to trade mainland shares from the HKEx and vice versa. As of Nov. 16, 2018, funds flying from Shanghai to Hong Kong through the stock-connect program totaled 10.3 trillion yuan during four years of operation, according to the Shanghai exchange. In April, securities regulators quadrupled the daily limits on trading through the stock links to further expand access between Hong Kong and the mainland. In 2018, capital flowing from Hong Kong to the Shanghai exchange through the program more than doubled from the previous year to 26.6 trillion yuan ($4 trillion), reflecting foreign investors’ growing interest in the mainland market. The southbound flow grew 5.67%. While the closer ties brought fresh capital to both markets, they also fanned concerns that the surge of mainland capital in Hong Kong would bring more fluctuation and speculation to the city’s market. Unlike the Hong Kong market, where professional institutional investors play the major role, the mainland market is dominated by small retail investors. Despite the growing volume of capital, Chinese investors have yet to play a crucial role in the Hong Kong market’s pricing and valuation, said Chen Changhua, head of the China research department at Credit Suisse. That is mainly due to the lack of consistent investment strategy and framework for most mainland funds, Chen said. Eric Bian, Emerging Markets Equity Manager at JP Morgan Asset Management, foreign investors still account for the major part of the Hong Kong stock market, although the influence of Chinese capital will keep growing. It is important for Chinese investors to adopt longer-term vision and strategy in the Hong Kong market, Bian said. Although officials including HKEx chief Charles Li have repeated that cooperation should always outweigh competition, clashes between the Hong Kong and mainland bourses became more visible as competition grew more heated. In July 2018, the Shanghai and Shenzhen exchanges issued a joint statement barring mainland investors from trading stocks with different voting rights through the stock-connect programs. The move came shortly after the HKEx revised its rules to attract companies with nontraditional shareholding structures, which are mostly tech heavyweights like Xiaomi. The mainland bourses’ decision was seen as an attempt to compete with Hong Kong for new tech listings as regulators in Beijing prepared the CDR pilot programs to encourage Chinese tech majors to list at home. But the pilot programs were later postponed after Xiaomi and Alibaba decided to put their CDR plans on hold because of unfavorable market conditions and unsettled policy issues. In December, mainland and Hong Kong regulators reached an agreement to allow trading of stocks with weighted voting rights through the stock link programs and to work on formulating relevant regulations and procedures for implementation in mid-2019. The move aims to “further enhance the mutual market access programs and promote the coordinated development of the mainland and Hong Kong capital markets,” the HKEx said in a statement. An official close to the China Securities Regulatory Commission (CSRC) called on mainland securities market players to be more open-minded in line with the country’s reform goals. “Promoting reform by opening-up is a consistent thought of the mainland’s securities system,” the official said. Experts said Hong Kong can serve as a good model for the reform of mainland stock markets. Even though the different political and judicial systems grant different powers to securities regulators, mainland regulators can still learn from Hong Kong to fulfill their commitment to further open-up its financial sector and remove excessive government control, experts said. “Respect for market rules and the rule of law is the core value of the Hong Kong market,” Credit Suisse’s Chen said. Regulators on both sides have stepped up communication and coordination on market supervision. In December, the Hong Kong Securities and Futures Commission said it would enhance the exchange of information with the CSRC under the stock-connect programs to identify mainland investors behind transactions as a way of combating cross-boundary market misconduct. On the mainland, regulators have moved to relax tough limits on stock-index futures to provide more risk-hedging tools for overseas investors and further close the gap with the Hong Kong market. “Overseas investors need proper stock-index futures in both the Hong Kong and mainland markets to help them manage risks so that they can invest in the A-share market with confidence,” said the official close to the CSRC. Hong Kong is a significant part of China’s capital market and a gateway to the world, analysts said.